1910s: World War I focused attention on food conservation; post-war demand for home economists. 1917: Founding of the American Dietetic Association (now known as the Academy of Nutrition and Dietetics). 1918: State funding for a women's dormitory and establishing of a program for women in home economics. 1919: Arrival of Edna Lucy Skinner from Pine Manor College, Wellesley; began offering courses in Textiles and Clothing, Foods, Cooking, and Household Management; converted old barn into Food Technology Laboratory. 1922: Food Laboratory in Fernald Hall. Edna Skinner reported that "the space...is inadequate and the drainage is so poor that it is impossible to maintain a sanitary, wholesome condition." 1924: The Home Economics Program became a department with 77 students; added a course called "Dietetics" taken in the junior year. 1925: The "Tentative Scheme for Home Economics" lists "rural nutrition worker" as a vocation for which women could train. 1925 – 1930: A 4-year degree plan for Home Economics majors; the Homestead Management House on the site of the current Graduate Research Center; five faculty members serving 40% of the female students. 1930: Recruiting brochure mentions "hospital dietitian" and "visiting dietitian" as career options; establishment of a new Freshman course, A Study of Foods in their Scientific and Economic Aspects, Home Economics became a division. 1935 – 1941: UMass Amherst Professor Helen Mitchell was chairperson of the Professional Education Section of ADA; in conjunction with Home Economics Association established the first uniform set of guidelines for dietetics programs. 1945: Home Economics became a school with Edna Skinner as its first dean; founding of the Department of Foods and Nutrition. 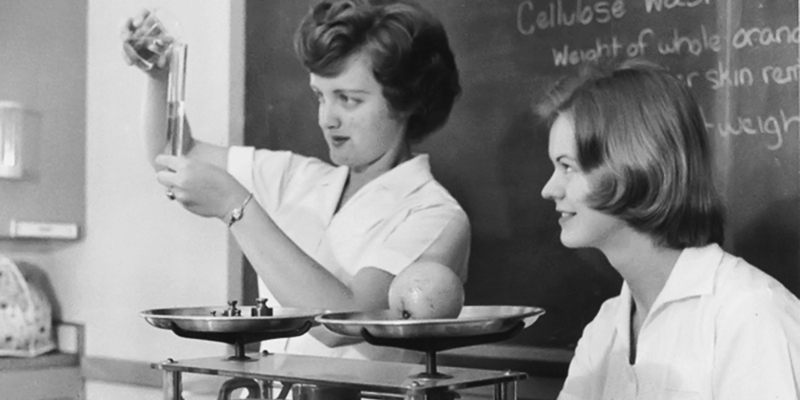 1951: There were 6 courses offered in Foods and Nutrition, including separate Nutrition courses for majors and non-majors. 1952: For the first time, the recruiting brochure said "meets the requirements for membership in the American Dietetic Association." 1954: Annual report mentions a high demand for Nutrition graduates; eight recent graduates were in dietetic internships. 1958: The program had twelve graduate students. 1972: Nutrition merged with the Department of Food Science and Technology (College of Agriculture) to form the Department of Food Science and Nutrition; Nutrition faculty moved to the old section of Chenoweth Laboratory. 1988: Nutrition split from Food Science to form the Department of Nutrition. 1989: Virginia A. Beal presented the first yearly lecture established in her honor. 1990: A Dietetic Internship (AP4) was approved. 1993: Under a new reorganization plan, the Nutrition Department was reassigned to the renamed School of Public Health and Health Sciences. 1996: First online nutrition course (noncredit) offered for teachers. 1997: UMass Extension EFNEP program joined the Department of Nutrition. 1998: Accreditation of the Dietetic Internship by the Commission on Dietetic Registration; first online credit course offered, Nutrition Science Online. 2002: Accreditation of the Didactic Program in Dietetics by the Commission on Dietetic Registration. 2005: PhD in Public Health-Nutrition Option was approved. 2008: Online MPH in Nutrition Program begins.